It seems like only yesterday when an apparent falling out led landlord David Kraft to part ways with Tom Angelica, the lone survivor of a three-man partnership that resurrected downtown Champaign’s Art Theatre in the mid-Eighties. Now, percolating murmurs have anticipated the concrete fact that Kraft will part ways with current Art operator Greg Boardman, whose lease runs out after next Wednesday, December 30. While this turn of events has been handled in a more civil manner publicly than what happened in 2002, neither sat well with Art fans and cultural purists who could see no other use for the building at 126 W. Church St. than as a single-screen movie house. It’s certainly a daunting livelihood to pursue in the 2009 economic climate unless one has P.T. Barnum chutzpah running through one’s blood. Since we already know the happy ending, this post will not attempt to read code and determine conspiracy in what killed the Angelica and Boardman eras. We’ll sparingly note what the general public could already sense, in that conflict of personality and business acumen were the most likely factors leading to the turnovers. In that respect, C-U Blogfidential refrained from crying wolf with the knowledge that a suitor, now revealed as local software professional Sanford Hess, had been assessing the Boardman-Kraft situation and banking on them accepting offers based on market realities. The Art will close on New Year’s Eve due to legal reasons, according to Hess’ recent post on the Champaign Movie Makers on-line forum, after which he will reopen on Friday, January 1, with a one-week run of ME AND ORSON WELLES, directed by Richard Linklater (BEFORE SUNRISE) and starring Zac Efron and Claire Danes, to be followed by THE MESSENGER starring Ben Foster and Woody Harrelson. Until then, Boardman offers his final presentation, a 60th anniversary re-release print of the classic Vittorio De Sica picture, THE BICYCLE THIEF (1948), which will show daily through Wednesday at 5 p.m. and 7 p.m. with a 3 p.m. matinee on Sunday, December 27, all at a reduced ticket price of $5.00. In his final e-newsletter, Boardman pointed towards this vintage trailer from a 1972 reissue, which will give you an idea of the film’s famed Neorealist aesthetic. 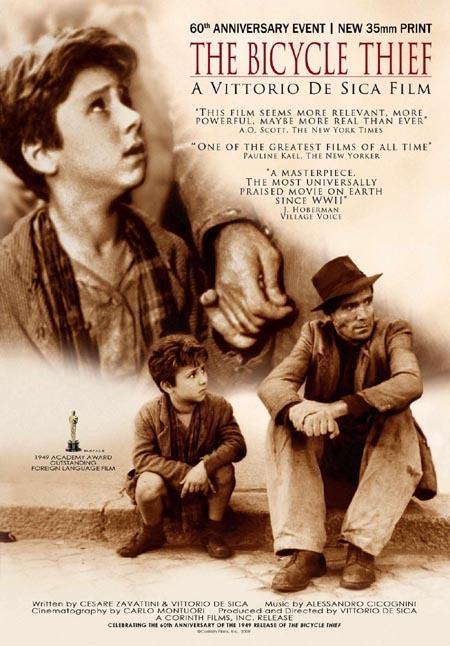 THE BICYCLE THIEF received a special Academy Award in 1950 for the most “outstanding foreign language film” released in the United States the prior year. The current theatrical distributor is revival specialist Corinth Films, with the ubiquitous Criterion Collection edition available for home viewers. Look for more posts soon on CUBlog about the transition. This entry was posted on Saturday, December 26th, 2009 at 7:13 pm	and is filed under Public Events. You can follow any responses to this entry through the RSS 2.0 feed. Both comments and pings are currently closed. 14 distant relations of Jan Tschichold dissected this page in 0.369 seconds while exacting sweet revenge in silence.